Holywell Hall provides the perfect backdrop to bring your dream of a quintessential English and classic country garden wedding to life. Say your vows surrounded by those you love most in the world. Celebrate your marriage with a perfectly planned party in a truly exclusive, private estate setting and relax knowing that everything is taken care of. True to our wish of giving you the luxury of choice, Holywell Hall has plenty of options for you to choose from for your ceremony. Let the hidden charm of our gardens bring natural beauty to your wedding with a ceremony in the Garden Terrace or within the Walled Garden itself. If you’re looking for a statement backdrop, then you have the light-filled Orangery, Fishing Pavilion or recently uncovered and renovated Dovecote to choose from. 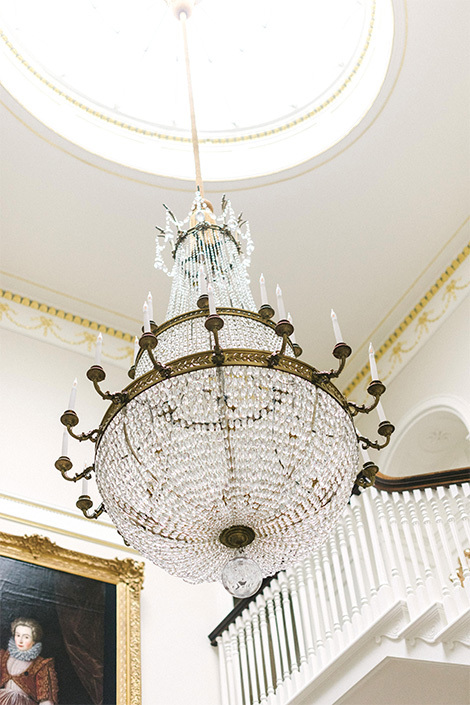 For your ceremony only, we would love to open our house doors to you and your guests to say your vows in the stately Grand Hall or light-filled Garden Room. Holywell Hall’s private Church, St Wilfrid’s, is available to you for blessings where you can be joined by up to 60 guests. There are also options locally for religious ceremonies of all denominations, including the famous Normanton church in Rutland. A ‘ceremony only’ option is available at Holywell Hall. As with all the weddings we host, there are no set ‘packages’. Instead, you’re able to choose the number of hours that you’re with us, the location of your ceremony and you’re still able to hold your drinks reception here before you leave, if you’d like to. Your wedding reception at Holywell Hall will be, quite rightly, a celebration you will always remember. For your drinks reception there are numerous locations within the grounds and gardens that provide the perfect setting for champagne, cocktails and canapés. With plenty of space for up to 150 guests to socialise and entertain, your options are limitless. After drinks, you and your guests can head to your marquee on the croquet lawn outside the Orangery. Built exclusively for you by one of our recommended suppliers, your marquee makes it possible to design and tailor every element of your wedding reception. Our carefully chosen caterer will then serve your guests with a delicious wedding feast, including your own corkage free drinks. After dinner we welcome and encourage you to dance the night away until the early hours. The grounds of Holywell Hall are exclusively yours for your wedding and we offer flexibility within our prices for the number of days hire depending on how long your marquee company needs. We want you to relax and enjoy the lead up to your wedding so will work with you to ensure that enough time is also factored in for any styling and personalisation. The house itself remains a private residence however, should you wish to host your ceremony in the stately Grand Hall or Garden Room then we would love to welcome you and your guests indoors for part of your day. The Garden Room, overlooking the Terrace, lake and Church, also doubles up as a wet weather contingency for your drinks reception. For exclusive marquee weddings, we are pleased to offer you the delightful Rose Cottage and the recently refurbished Stables here at Holywell Hall for the Friday and Saturday nights of your wedding weekend.The beautifully furnished Rose Cottage includes two en-suite double bedrooms, sleeping up to four people. In addition to gym and spa facilities, The Stables has a further three bedrooms, sleeping up to eight, as well as a kitchenette and dedicated area for bridal prep. All properties include fresh linen, robes, Molton Brown toiletries and a welcome hamper containing local produce and a celebratory bottle of something bubbly. Outside of Holywell Hall, there are numerous accommodation options for your guests. You’ll find details of a selection of recommended hotels on our guest pages and of course, we are always happy to make further recommendations if required. We understand completely that the right suppliers and partners are crucial to the success of your wedding day. To give you the very best experience possible, we have partnered with the multi award-winning wedding planner, Katrina Otter Weddings. If you’d like some assistance planning your day, then Katrina has connections with the best suppliers from the surrounding area and also from London. All wedding days at Holywell Hall are personally overseen by a member of Katrina’s highly skilled team so you relax and enjoy the day knowing that everything is being taken care of. When you come to visit Holywell Hall, we’ll be pleased to share our list of recommended suppliers with you. This list contains details of carefully chosen wedding professionals who can assist with all elements of your wedding day. We do ask that you select your caterer and marquee provider from our list, as these companies totally understand Holywell Hall and the logistics involved. For all other suppliers, you have total freedom to choose those that best suit your day and we look forward to seeing your plans come together. Weddings at Holywell Hall are all unique. Our elegant, relaxed and exclusive nature means that we don’t require you to sign up to a package or fit yourselves into a style of wedding that we’ve defined. Instead, we provide you with a bespoke quotation based on your own individual requirements. We host a limited number of weddings from early May to late September and, as a guideline, prices are from £2,000 +VAT for ceremonies only. For marquee weddings, prices are from £10,000 +VAT for the hire of the gardens, grounds, use of Rose Cottage and the Stables and an on-the-day coordinator. The cost of your wedding marquee is then up to you and we are happy to provide you with recommendations and any guidance that you may need in order to find a marquee that best fits your overall wedding style and budget. Please do contact us to request further details regarding pricing and / or to arrange an appointment to visit. For a copy of our wedding brochure, please fill in your details below and you will be able to download a version.